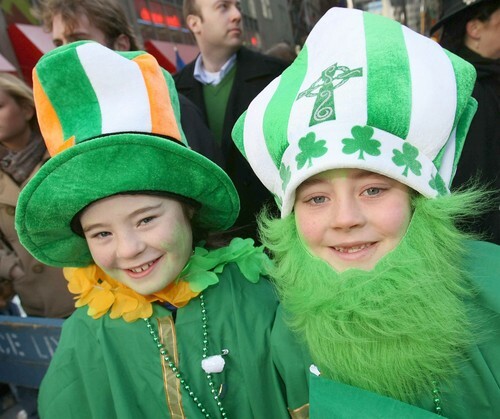 St. Patrick’s Day is a chance for everyone to celebrate Irish culture and heritage. We’ve put together a fun list of activities and facts for your children, with a cheeky Irish themed cocktail recipe at the end for parents! The weather has been so nice over the last couple of days here in Toronto, if it continues you could head out into your garden with your children. Plant some shamrock seeds and talk about the importance of gardening: you could mention anything from the source of food to looking after the environment. Alternative you can by little pots and plant your shamrock seeds indoors, either way your kids get to make a bit of a mess with a spade and you’re broadening their minds at the same time! St. Patrick’s Day is the feast day of the patron saint of Ireland named St. Patrick. Patrick wasn’t born Irish, he was brought to Ireland as a slave after he was kidnapped. He managed to escaped back to Britain to be with his family but while there, a voice told him to go back to Ireland. He was ordained as a priest and spent the rest of his life working to bring Christianity to Ireland. St. Patrick’s Day is the national holiday of Ireland and we celebrate it each year on March 17 because this is the day he is rumored to have died. People search for four leaf clovers which are very rare, finding one is supposed to be very lucky. A shamrock is actually a three leaf clover like plant. Legend has it that St. Patrick used the shamrock to explain the Holy Trinity (the Father, the Son, and the Holy Spirit). The colour of St. Patrick’s Day is green. Ireland is known for it’s green shades of grass and the shamrock is green as well. Traditionally people eat corned beef and cabbage on St. Patrick’s Day although we enjoy it all year. Some people claim that St. Patrick drove the snakes out of Ireland. However, science has proven that there never were any snakes in Ireland because of the cold climate. It is thought that the word snakes in this legend actually represent driving out the pagan ways when he introduced Christianity. Irish legend says that there is a small Irish fairy called the leprechaun. He wears pointed shoes, a hat and a leather apron. According to the legend, he’s very unfriendly and lives alone in the forest guarding his pots of gold. The story says that if you find a leprechaun, he will have to tell you where is gold is hidden. If you look away for even one second, the leprechaun will disappear along with all his gold. Corned beef is a traditional Irish meal eaten throughout the year, but it’s a favourite on St. Patricks day. If you have time, spend an hour or so making it from scratch with help from your children. Not only is it a lot healthier to make a homemade version compared to the processed store bought alternatives, you’re setting a good example for your children (to eat healthy) and you’re bonding over the simpler things in life rather than games and tv. We really like this simple math game for kindergarteners from Coffee Cups and Crayons. Mix the pear juice and the whiskey together in a liquid measuring cup or some other cup that has a spout, which will make it easier to pour. Divide the mixture equally between two Champagne flutes. Slowly top with bubbly, then garnish with a lemon twist. Enjoy! Place all the ingredients into a food processor and run the machine until the mixture is pureed. You may need to stop and scrape down the sides a few times to get the mixture smooth. Place a fine mesh strainer or sieve over a non-reactive bowl, then pour the mixture in. Allow the juice to drain out, stirring the puree gently to help the process along. Serve right away!